The US Army’s 11th Transportation Battalion, in collaboration with the Naval Beach Group 2 and component commands has concluded Exercise Trident Sun 2018. The Trident Sun exercise has been carried out in preparation for Operation Trident Juncture 18 to be conducted in autumn this year. 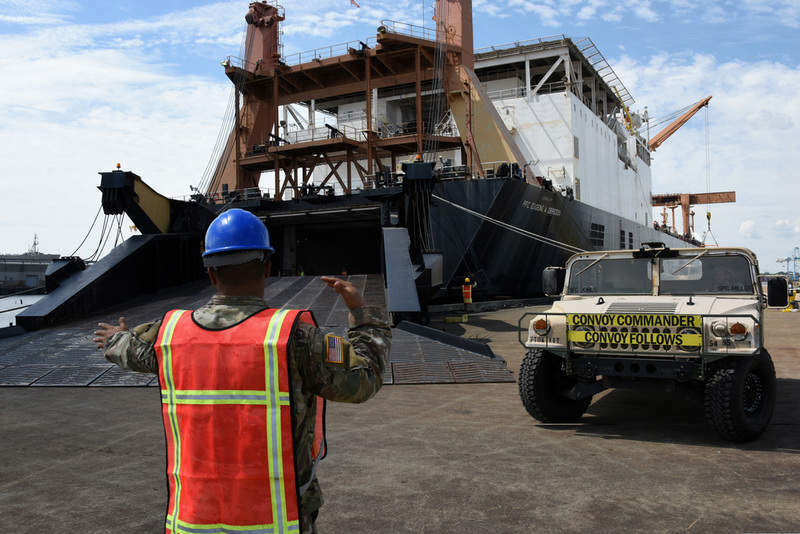 During the exercise, the Navy Support Element (NSE) personnel carried out Maritime Prepositioning Force (MPF) operations in order to offer training to Reserve component personnel with regard to the instream offload of military vehicles and equipment from the Military Sealift Command’s (MSC) container and roll-on / roll-off ship USNS PFC Eugene A. Obregon (T-AK 3006). Sailors from the Naval Beach Group 2 successfully offloaded more than 60 pieces of essential cargo on to Improved Navy Lighterage System (INLS) Causeway Ferries by using the roll on / roll off Discharge Facility (RRDF) platform and shipboard cranes to load cargo directly from the vessel to ferry. The Naval Beach Group 2 is capable of speeding up the process of offloading equipment, thereby ensuring that the maximum amount of warfighting supplies and equipment reaches friendly armed forces as early as possible. According to Amphibious Construction Battalion 2 Trident Sun Detachment officer in charge lieutenant j.g. Anthony Holl, this year’s exercise enabled sailors to practice major mission capabilities and understand their individual roles from an operational perspective.